Fresh-made Green Curry: Fresh-made Green Curry with Fresh Kanom Jeen Rice Noodles (Kanom Jeen Gkaeng Kiow Wahn). Kasma's Green Curry with Fish/Shrimp Dumplings Gkaeng Kiow Wahn Loogchin Bplah Gkoong) could be served over kanom jeen noodles; it is taught in Advanced Series Set A (class 2). 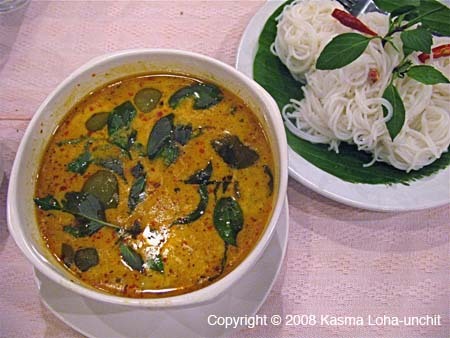 She also teaches Easy Green Curry with Pork (Gkaeng Kiow Wan Moo) in Beginning Series (class 1).